With the new expansion you now have the ability to gain npc allies to fight with you in combat outside of Forbidden Instances. 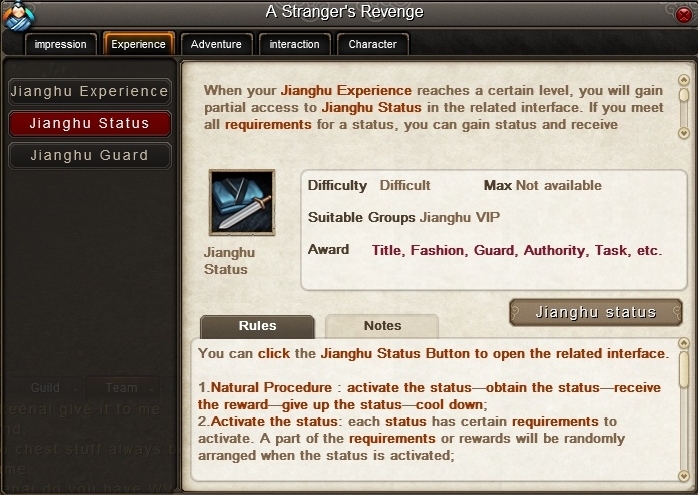 In order to unlock this you need to gain both Jianghu Experience and befriend many npcs. Once you reach the Ignorant level you can begin working on gaining a guard. To do this you must first unlock the title you want. You can find this in the Guard tab in the C menu or through the “A Stranger’s Revenge” menu. This will show all the titles and status including ones you cannot access. 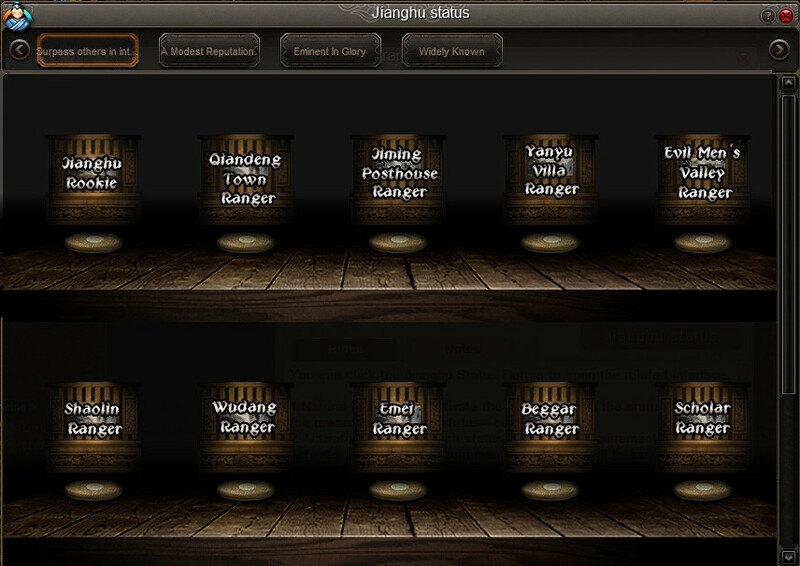 Until you get to the Ignorant Jianghu Experience level you can only access that first page with Ranger titles. 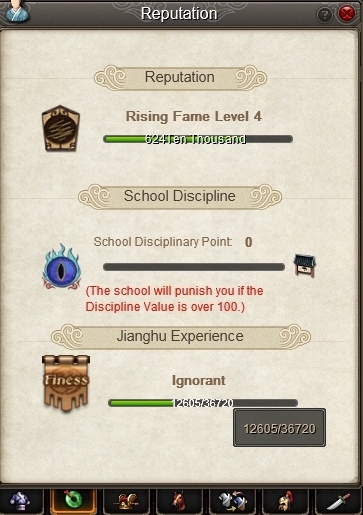 Once you get to Ignorant you can access the “A Modest Reputation” tab which has titles with npc guards in them. To unlock a guard you first have to find out which title they belong to. 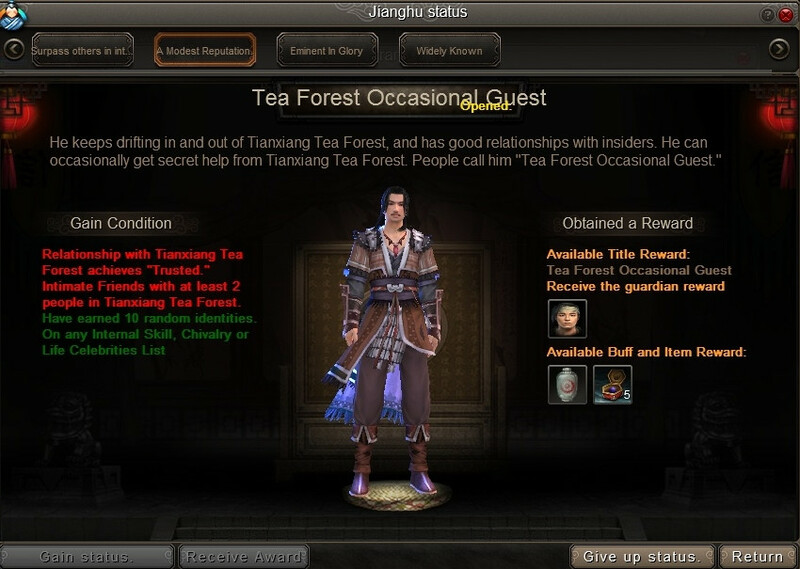 In the instance above he is the basic guard for the Tianxiang Tea Forest. To unlock this guard you first unlock the required conditions, being friendly with the tea forest faction, being intimate friends with at least 2 people in the tea forest, and earning 10 of any other titles. Most people are aware of how to become friends with npcs. Find npcs with this reputation bar over their head then medidate, give them gifts, and do quests around them. Their bar will go up over time and you will gain Jianghu Experience whenever someone likes something you do. 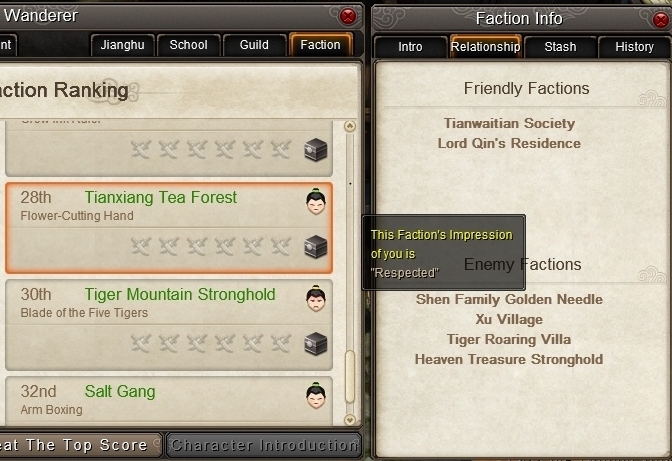 By hovering over the face you can check your current rating and by checking the relationship tab you can check who that factions friends and enemies are. The important thing to realize about the relationships is that if you fight a faction your relationship with their enemies will go up and your relationship with that faction will decrease. For example with the Tea Forest fighting the Shen Family Golden Needle will increase your relation with the Tea Forest however fighting the Tianwaitian Society will lower your relation with the Tea Forest faction. Once you complete all of the conditions you may claim your title and your guard npc. Be aware that these titles are time limited and will expire but can be reclaimed so long as your reputations levels stay above the condition.